This particular Custom Axiom One-off is crafted from multiple hardwoods and camo G10 composite. The face of the slingshot is made from 3/8″ thick G10, so don’t worry about fork hits and abuse. 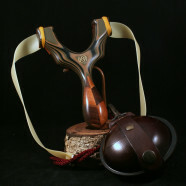 The back of the slingshot is made from custom hardwood laminate consisting of Black Walnut, Black Cherry, and Paduak. All of the wood has been sanded buttery smooth and thoroughly sealed with a hard wax oil. Capable of shooting both over the top and through the forks, this Axiom looks as good as it shoots.